Politicians and unions in the East Bay are stepping up the pressure on Sutter Health to keep Alta Bates Medical Center operational as a full-service hospital. On Tuesday, a task force unveiled a long-awaited report by UC Berkeley heath planning researchers on the impact of the hospital closure on health in the East Bay. The report used state hospital admission and GPS tracking data to understand the impact on emergency room patients driving around the East Bay. It compared the drive to Summit Medical Center near downtown Oakland to the drive to Alta Bates. When there's no traffic at midnight, travel times were shorter from all across the East Bay. The report found no surprises there. Even though the Oakland hospital is closer to the freeway, at peak rush-hour, 5:30 p.m., the report projects that, on average, patients will take longer to get to Summit’s emergency room. It’ll take 10 to 20 minutes longer from parts of Richmond and San Pablo. Patients in parts of West Contra Costa would be hit especially hard because Doctors’ Medical Center in San Pablo closed in 2015, says Prof. Jason Corburn, the lead author on the study and an expert in healthcare planning. "Hospital closures don't happen randomly. They often happen in already segregated communities that have less access to quality health services, and these are often segregated communities of color,” Corburn says. Sutter Health says state seismic rules mean most of Alta Bates’ buildings would need expensive retrofitting by 2030. Alta Bates cardiac unit has already moved to Summit. If Alta Bates closes its emergency room, Corburn says Berkeley's most vulnerable populations, like senior citizens and the homeless, will suffer. He also says the birthing center at Alta Bates where almost 6,000 babies were born last year, would impact the health of mothers and infants across the East Bay. Sutter has criticized the report for being "limited in scope." The report also says if Sutter consolidates emergency services at Summit, they'd have to double the emergency room capacity there. Summit has not yet taken out any permits to begin that process. 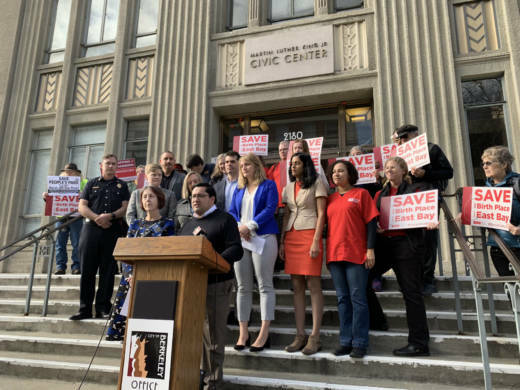 Berkeley Mayor Jesse Arreguin says Sutter hasn't been forthcoming about exactly what would happen to Alta Bates, which means that he and his staff can’t plan. "We have not gotten the information we requested. We do not have a clear plan of what Sutter intends to do. Do they intend to stay in Berkeley or not?" Arreguin says. Last week, Berkeley’s City Council directed the city manager to ask Sutter to rebuild in Berkeley or sell the property to another hospital willing to work with the city to come up with a different solution, like finding another location for an emergency room and acute care.